Monsters from space are set to invade your iOS device. But don’t worry, they’re the friendly kind. In Namco’s new flick-based puzzle game, Mooniacs, you need to help several stranded aliens recover their ship parts and find their friends. Last week, Macworld got a hands-demonstration with Namco Bandai’s latest iOS game. 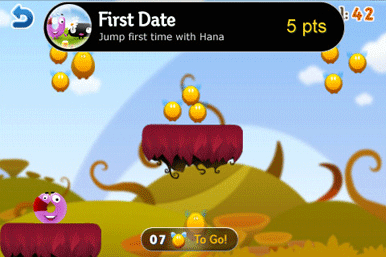 It has a familiar gameplay mechanic to those who have played Angry Birds or Crash the Crib. Your object is to clear the stage of JuJuBees, the currency/food of your strange characters. In each level, you can slide your character from one side to the other and pick the angle and direction of your attempt. But unlike other puzzle games, you only get one shot, so you better make it count. Not only are you trying to collect as many pieces of JuJuBees as possible, but you also must gather pieces of the ship that marooned the Mooniacs in this strange land. In a twist on the flick-action-puzzle genre, your goal is to not only clear the entire stage of items, but to do so in a particular order. To earn the most points (and get the most stars on a level) you’ll need to aim for special multiplier fruit first. As you progress, you’ll unlock the different Mooniacs and their unique abilities. You initially start with a peculiar U-shaped alien that tends to roll up during flight, causing it to bounce in a specific way. 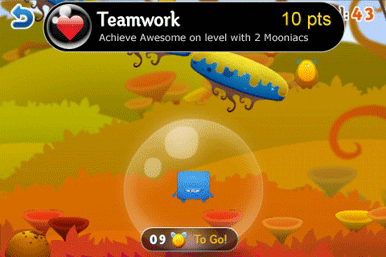 Other Mooniacs bounce differently or have different special abilities that you must utilize correctly to clear a level. While the aesthetics of the game are cartoonish and the characters recognizable, I wouldn’t consider them cute or something kids will flock to. Indeed, the ever-increasing difficulty (especially of the later levels) makes this an app that even an Angry Birds aficionado would find brutal. You’ll not only have to use your alien characters individually in a hairsplitting test of accuracy, but later challenges require you to tag team the aliens—something I found particularly challenging. The game has over 90 levels and three worlds to conquer. You’ll have to navigate scenic forests, mushroom kingdoms, and other natural settings in order to complete the game. Coming in April (price not yet set), Mooniacs looks like a brutally challenging and yet oddly cute puzzler.